tl;dr There are three trends that are changing the nature of martech. They will catalyze the end of the “first golden age of martech” and lay the foundation for a second golden age that will be much larger, but likely look quite different. Ecosystems — instead of marketing cloud suites vs. best-of-breed point solutions, we will have the best of both: open platforms that serve as stable foundations, augmented by large ecosystems of specialized third-party apps that are more deeply integrated. Experts — the lines between software vendors and professional services firms will blur: software companies will offer more expert services; services firms will automate and bottle their expertise in code. Disclosure: Before continuing, note that outside of writing this blog, I am also VP platform ecosystem at HubSpot. So I naturally have a biased opinion of the future of platforms and ecosystems in martech — hey, it’s in my job title. But I believe you can see these patterns emerging across the industry at many, many companies. I’ll also disclaim that this post is my personal opinion and not necessarily HubSpot’s. “Is it expanding or consolidating?” is the obvious question you might ask. But give or take a few thousand companies in either direction, the size doesn’t really matter. Anything more than 2,000 vendors qualifies as “a ship ton,” to use the French nautical term for it. And believe me, there’s still a ship ton out there. Unless they’re on an up-and-to-the-right trajectory at scale, #1 and #3 are going to be tough. Many will seek #2 as the “easy” way out, making 2019 a buyer’s market in martech M&A. The volume of those selling will exceed the capacity of buyers to absorb them all. However, the diversity of buyers will expand — an interesting trend that we’ll discuss in more detail. Some will reconfigure to reach profitability. As the saying goes, SaaS never dies — it simply auto-scales to a smaller AWS instance. But sadly, more than a few will end up on the scrap heap. Yet in spite of that looming crunch, there are new martech ventures still entering the market today. “For God’s sake, why?” I can hear you exclaim. Well, there are effectively zero barriers to entry, with cheap cloud infrastructure, free open source foundations, and a seemingly unending stream of creative new tactics and touchpoints continually emerging in marketing’s domain. If anything, those forces are accelerating. There’s plenty of room to imagine better experiences for marketers and their customers. It’s still an innovator’s paradise. Interestingly, more and more of these next-gen martech ventures are starting out with move #4 from the get-go — building a sustainably profitable business without taking venture capital. The “how” of building a sustainably profitable martech business is a tied into the three major trends that are reshaping the field. We’ll discuss each of these in more detail below. But before we do, it’s worth noting that the transition from our first golden age to our second one will be difficult for a number of the first generation martech vendors, primarily those who have been reliant on VC funding but have yet to achieve profitable escape velocity. We’ve been in the First Golden Age of Martech for the past 6 years. During these heady times, the sector expanded seemingly without limits. But those limits are appearing now. Mostly from the constraints of the VC investment model — there’s only so many billion-dollar unicorn software pure-plays in the martech space in a given decade, and we’re pretty close to saturated at this point. These next couple of years will be a challenging “age of reckoning” for the current generation of marketing technology ventures. If it coincides with a macroeconomic recession, attrition in the space could be significant — although I’ll stake claim to a worst-case upper bound of at most 40% over the next two years. More likely, 1/5 to 1/4 of the existing players will churn in that time frame. The rest will adapt to their environment, buoyed by continuing digital transformation. The underlying dynamics of digital customer experience that have driven martech aren’t a fad. They’re the new ballgame, and we’re still in the early innings. It could be a bumpy ride for the next 18-24 months. But on the other side, I believe a second golden age of martech will emerge. Albeit in different configurations, I believe there could be even more “martech” companies than we saw in this first golden age. But organized in an industry structure that will be much better for marketers. Our three martech trends — ecosystems, experts, and (citizen) engineers — will define and enable a new wave of growth across the sector. They’re already coalescing today. #1. Platform ecosystems and networks as the center of gravity. One of the surprising characteristics of the Cambrian explosion of martech over the past 6 years was that it happened without being particularly anchored around platforms. Sure, there were a few. Salesforce in CRM. WordPress in CMS. More recently, Shopify in ecommerce. But compared with platform ecosystems such as iOS and Android in the mobile market — which spawned millions of diverse apps that could be seamlessly installed with a single tap — martech wasn’t very platform-y. Every marketing stack was its own mix of tubes and wires. A couple of years ago, I argued that the industry had gone post-platform. Thanks to integration platforms (iPaaS) and the emerging wave of customer data platforms (CDPs), connecting the tubes and wires between apps in your marketing stack was becoming easier. But these weren’t platforms to the same degree as, say, an operating system. They were more like marketing middleware. They helped shuttle data between apps — which was super helpful, especially when it got easy enough for “citizen integrators” to do it without taking a number in IT’s mile-long deli line. Yet each app continued to live in its own little bubble of workflow, user experience, and governance. There’s tremendous potential for innovation if we can break through those bubble barriers. As an example, Apple’s iOS platform serves three out of four layers — workflow doesn’t really apply in that context. In contrast, most of the platforms in martech have primarily served the data layer, with a few lightweight pieces of workflow and UI. I imagine we’ll see more of those kinds of integrations in martech platforms ahead. In addition, the raft of privacy regulation taking hold in the marketing industry will incentivize platforms to take a more proactive stance on governance for compliance reasons. Collectively, martech platforms can bring significantly greater cohesion to marketing stacks. Here’s why this can be transformative for the martech industry. Frankly, what’s held martech back — if you can consider The Martech 5000 as a “held back” expression of its DNA — has been the lack of deeper integration. Even with significant advances in martech platforms over the past couple of years, there’s still significant friction in adding new products to a marketing stack. That friction isn’t only challenging for marketers. It’s also challenging for martech vendors. They’e often selling against friction and inertia more than a competitor. Convincing a prospect of a new capability you can offer them, on the merit of its own ROI, isn’t enough. You have to overcome the barriers of their environment too. Reduce that friction, and you could open up a whole new generation of martech innovation. It could enable a much broader set of martech vendors who don’t need to raise large VC rounds to create profitable businesses within a platform’s ecosystem — micro-ISVs filling out a long tail of specialized and niche capabilities that are easy for marketers to add to their stacks. There will still be VC-funded martech ventures, striving to be a category leader that operates across many platform ecosystems — or to become one of the leading platforms themselves. I think of those respectively as the “torso” and the “head” of the martech long tail. But in sheer volume and variety of martech capabilities, the tail will be what’s revolutionary. If you look across the ecosystems of major martech platforms today, you can already see this taking shape. Extrapolate this trend over the next few years, and it’s not hard to imagine how it defines a second golden age of marketing software. 2. Experts blending software and services to deliver outcomes. Around the time the martech landscape crossed 1,000 vendors in 2014, I remember talking with one of the executives of the 4A’s (American Association of Advertising Agencies) — talk about alliteration — about something highly ironic. While marketers were freaking out about having to choose among 1,000 different marketing technology vendors, none of them seemed particularly bothered by the fact that there were more than 10,000 agencies in the U.S. alone that they had to choose among for services. And that’s not including management consultants, systems integrators, or any of the other varieties of external guns-for-hire in the marketing world. Gartner’s latest marketing spend report claims that 23% of marketer’s budgets are still spent on agencies today — not including money spent on paid media, which is an additional 23%. Most agencies were considered “fungible” — you could swap one out at any time. Most agencies were hired to deliver outcomes or packaged assets — not build new capabilities inside a client’s firm — which made them easier to evaluate and engage. In contrast, marketing technology software hasn’t been particularly fungible. And the decisions required to evaluate, purchase, and operate it have certainly been more complex. Arbitrage on media placement has been decimated by programmatic advertising. The scope of marketing has expanded dramatically and become much more complex. Clients are moving more software-powered marketing capabilities in-house. Martech vendors themselves are competing against them for marketing’s budget. To support those clients, agencies have to become martech experts themselves. Technology and management consulting firms increasingly vie for the CMO’s ear. Gig economy networks have put downward pressure on hourly service economics. Yet here’s the thing: clients have never been in more need of help than they are today. Marketing is insanely complex and evolving at a breakneck pace. Martec’s Law is a very real dilemma. From a human resources perspective, most firms can’t organically adapt fast enough on their own — they need to turn to outside experts to bridge the gap. Service providers who assemble the right talent and develop deep expertise in specific aspects of modern marketing have enormous value to offer clients. If they can structure engagements in a way that captures enough of the value they create — perhaps in an ongoing, subscription-like format — with non-linear scalable economics, they can build a very good business. Hmm, almost starts to sound like a software business, eh? Consolidation among major marketing platforms are providing a more open and stable foundation upon which to create apps that can seamlessly plug in to a marketer’s stack. Because these third-party apps feed their data into the common platform, they have less lock-in power than most business software once had — customers can swap out an app at any time without losing the work the app did for them. Microservices and APIs in the cloud — and increasingly, serverless architectures using infrastructure such as Amazon Lambda — make it easier to package and deliver smaller chunks of software functionality. By remotely interfacing to the APIs of a client’s marketing stack, a service provider can bottle its “secret sauce” — its unique algorithmic processes and techniques — in scalable code, but still manage the client relationship as a service engagement. But you don’t have to be a large services firm to play the software card. In fact, this strategy is a way for smaller firms to differentiate themselves and punch above their weight class. As one example, take Blue Green Brands — the wonderful team who is also helping me with this year’s martech landscape — a boutique firm specializing in conversion optimization for major digital brands. They developed a number of clever techniques for analyzing and segmenting website visitors — and then optimizing their journeys accordingly. They recently bottled their expertise into a software product, Blue Green Analytics, that is highly tailored to their optimization process. This is a “best of both worlds” business model: Blue Green harnesses the positive dynamics of software, while clients retain benefits of service-oriented purchases. Clients buy outcomes — but with bonus capabilities beyond a project — and they don’t need to change their martech infrastructure because the Blue Green app plugs into existing open platforms in their stack. So is Blue Green a software company or a services company? Does it really matter? Their solution works for their clients/customers, who love them, and they’ve built a thriving business. On the other end of the universe, software companies — especially VC-funded ones — have been discouraged from offering services. Because traditionally, services were (a) not very profitable and (b) not very scalable. At least not in comparison to the economics of the classic kinds of exponentially growing software businesses that VCs love. And there was a concern that good services could mask bad software. “Let the software stand on its own merits!” As a product person, I can appreciate that. The problem, however, is Martec’s Law. The constantly advancing capabilities of innovative martech software has outstripped most organizations’ ability to fully harness its power. The software is brilliant, but most of their customers can’t internally develop the organizational capital to leverage it fast enough. They need training, which you’ve seen major martech companies really double down on in the past several years. But in many cases, they need more than that. They need advice on adapting it to their specific business. They need consulting on the intersection of marketing, technology, and management — see the Martech Manifesto. And they often need to be shown how to do it by example. First, feed a man a fish. Then teach him how to fish. Then collect lifetime recurring revenue. But for smaller or newer martech companies — the long tail of more specialized martech apps — they may need to provide services of their own to assure prospects that they will receive the help necessary to achieve the outcomes that their software promises. This can reduce friction in the sales process and, ultimately, increase the probability that a customer will be successful with their product, which reduces churn. It’s the transfer of expertise. I’ve actually seen some VC-backed martech companies embrace this model because, well, it works. But if the second golden age of martech consists of a majority of long tail vendors who aren’t funded by major VCs, but rather create sustainably profitable businesses in specialized markets from conception, then it doesn’t really matter what the VCs think. Where is the line then between software-powered services firms and service-enabled software companies? I don’t think it matters. We’re going to see a lot more of both. 3. Developers and citizen developers shape the firm. As Marc Andreessen famously said, “Software is eating the world.” In a digital world, every company will — to some degree — asymptotically become a software company. Most won’t be selling software products, or at least not things packaged as such. But the products and services that they sell will have software components to them. If a bottle of whiskey can go digital, anything can. Software increasingly drives customer-facing touchpoints and automated back-office processes, choreographing the front-stage and back-stage elements of a customer’s experience. Inherently, this digital dance is unique to each individual business — and therefore it almost inevitably includes custom code. We see this today with digital native brands, such as Netflix and Spotify, that have written most of their own customer experience software. But even at digital companies selling non-digital goods — pretty much the entire wave of new direct-to-consumer (D2C) brands — there is a little (or a lot) of their own software in their end-to-end customer experiences. It’s what helps make them, them. The whole “growth hacker” movement embodies this very principle: craft the software of the digital product/service itself to achieve “marketing” goals of customer acquisition, conversion, engagement, and retention. The line between product and marketing is blurry. You could argue — and I have — that this is the essence of digital transformation. Traditionally, however, this led to a “build vs. buy” fork in the road. Companies with software engineering resources on staff could build custom solutions for their exact marketing needs. The upside was that they could tailor it perfectly for their business. The downside was that a lot of what they built was general-purpose functionality that wasn’t really unique to their business at all, and they were wasting comparative advantage by sinking time and talent into it. But in the first golden age of martech, where most of the general-purpose functionality within commercial marketing software products was not accessible via APIs, they didn’t have much of a choice. They could buy an off-the-shelf product for a certain capability. Or they could build their own solution, customized to their exact needs. But there wasn’t much middle ground. The shift of the martech industry towards open platforms causes that dichotomy to disappear. Just as long-tail martech app developers can leverage these platforms to more easily distribute their specialized products — and services — individual brands can leverage them to build their own custom, one-off apps on a common core of the platform’s capabilities. They get to tap all of the general-purpose functionality of the platform, so they don’t have to reinvent the wheel. But they can augment it with just the additive functionality that is unique to their business. For that matter, as these platform ecosystems mature, they should be able to blend any combination of core platform functionality, third-party apps, and their own custom code — swapping components in or out and orchestrating them in a highly agile fashion. This leads me to what I beleive is the most revolutionary trend happening in business today: the democratization of marketing technology through tools that empower citizen developers, citizen integrators, citizen data scientists, and more. In short, non-technical business users can now use friendly tools to build apps (like with Betty Blocks). Or analyze data (like with Tableau). Or interconnect cloud services (like with Zapier). Or construct digital business process management workflows (like with Pipefy). I’ve just named one vendor in each category as an example, but there are literally hundreds of companies now empowering “citizen technologists” in one form or another. The space is seriously hot. The analyst firm ResearchAndMarkets predicts the low-code app development market will increase from $4.32 billion in 2018 to $27.23 billion by 2022, growing around 45% annually during the period. There was even a rumor last week that Amazon may launch a low-code/no-code product to make AWS accessible to business users. If you’re skeptical of this — and, no worries, many people are when they first hear about it — go read my article on how every marketer is now an app developer (even if they don’t know it). As with many great work revolutions, this kind of just snuck up on us. When did you stop to think how revolutionary a spreadsheet in the cloud was or what that might enable? 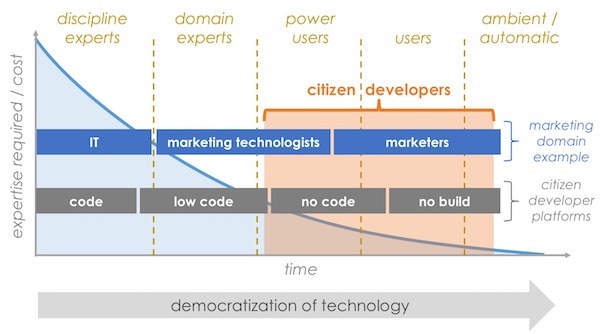 And here’s the punchline: increasingly, these “citizen developer” tools also integrate with all of the major martech platforms — as well as directly with many of the long-tail martech apps. Even today, you can use them to assemble custom business software that leverages off-the-shelf martech capabilities. As martech platforms continue to advance, the power that citizen developers wield to shape customer experience will too. Purists may debate what’s software engineering vs. what’s end-user configuration. Is it really software if you didn’t write it in a “real” programming language like Java? Like the line between software and services, I don’t think it really matters. But all three trends are also about breaking free of the “tyranny of OR.” Suite or best-of-breed. Software or services. Build or buy. Instead, it’s the “democracy of AND.” Platforms and apps. Software and services. Build and buy. The best of both. Regular readers might also recognize this dispelling of dichotomies as a continuation of the theme from the new rules of marketing technology and operations. You can centralize and decentralize. Automate and humanize. Breaking these either/or constraints will drive the Second Golden Age of Martech. P.S. If you want to learn about trends like these shaping marketing technology and how you can harness them in your organization, come join us at the MarTech conference in San Jose, April 3-5. We’ll have dozens of the leading experts in the field delivering vendor-agnostic, graduate-level presentations, over a hundred martech vendors exhibiting, and more than 2,000 of your peers. There’s no other event like it. Our early bird “alpha” rate expires at the end of this week, January 26. Get your tickets now before the price goes up. Fantastic read and insightful as ever, Scott. Totally agree on that point about the integration of systems. So many businesses are siloed in their approach – using a system in one department that doesn’t talk to the department next door. Good post, but I think you’re missing out on the evolution of Marketing Operations as the organization who can actually run Marketing Technology. I think the graph that you’re using on code/low code is disruptive right now, but I think there’s a large evolution of the Marketing Operations function to actually RUN Marketing Technology. I’d say that the “Marketing Technologists” is an aspirational role and won’t work within the real context of how organizations run. Instead, “Marketing Operations” would be the actually “scalable” buildout of the Marketing Technologists. As that “domain expert” for marketing operations for Marketing Technologies (centralized around marketing automation), I’m seeing much more nuance to the evolution of that MOPS definition, aka how companies actually integrate and operationalize Marketing Technology within companies. Furthermore, I don’t think that full decentralization is realistic considerations of how to run Marketing Technologies. The four functions of Marketing Operations (Campaign Production, Administration/Architecting, Marketing Intelligence / Data Science, and Development) don’t work at scale with generalists—the only way to scale the running of Marketing Technology (as we see with all our mid-market and enterprise clients) is to have a dedicated specialized team of Marketing Operations with people in each of those four functions. Finally, equalizing all MarTech tools in weight is a disorganized approach. In reality, I think that we’re seeing a consistent way that these MarTech tools interact with each other. Marketing Automation is the integration for all other tools—lots and lots of these MarTech tools are built to the specific data models from Marketing Automation tools and CRM, and so I would argue that Marketing Automation is the core center of Marketing Technology, and then other MarTechs who integrate are spokes off the primary core of Marketing Automation Platform.